CLEARWATER – A rat infestation at a Clearwater apartment complex is leaving residents disgusted. "You can see from the size of the tail, it’s a rat. 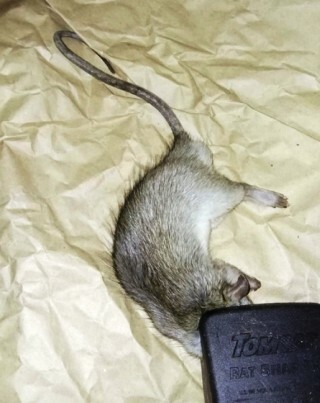 It ain't no mouse," said Michael McKinney while holding a rat he captured in his condo. McKinney and many others in his building say they started having a rat problem right after a new roof was installed. "You hear them in the wall and the ceiling and it sounds like they’re dragging something," said Shari Matthews-Fryer. Matthews-Fryer said the rats chewed through the waterline to the dishwasher, forcing her 80-year-old in-laws to rip up the flooring. "Water was everywhere, it flooded the whole kitchen out into the living room," Matthews-Frye said. "Last night, I was up all night because I heard activity in our Florida room and in the bedroom walls and I couldn’t sleep," said Angela Mugnaini who lives in the same building. After weeks of making calls to the complex and the health department, Angela and her husband said someone from the complex is coming Monday to look into the problem. "It should not have taken six weeks and that’s what got us angry," said Mark Mugnaini. We made several calls to the complex management office to learn what is being done to fix the issue but could not get through to anyone. People who live in other buildings in the complex tell me they aren’t having any issues. But residents in the affected building say they are fed up. "I want them gone. That's the bottom line," McKinney said.